Nitrogen coming from rivers does not move around in Puget Sound the same way as nitrogen coming from sewage treatment plants, experts say. As a result, these different sources of nitrogen interact with plankton and trigger low-oxygen conditions at discernibly different times and in different locations. Rivers discharge most of their nitrogen — from both human and natural sources — during wet winter months and during the high flows of spring, whereas nitrogen from sewage-treatment plants is more or less a steady flow. Complicating the picture even more are the variable flows of deep nitrogen-rich water that rise up from the depths of the Pacific Ocean and move into Puget Sound along the bottom. As rivers discharge into Puget Sound, the incoming freshwater tends to float on top of the denser seawater. 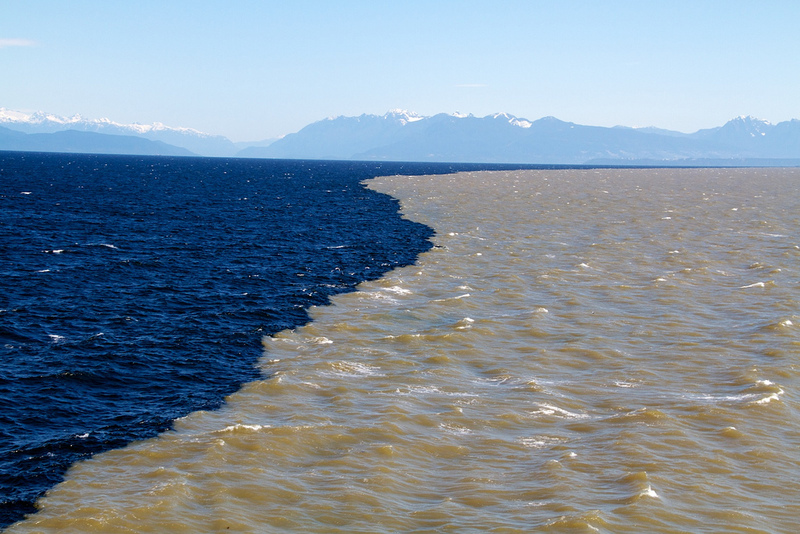 That lighter surface layer, enriched with nitrogen, moves back and forth with the tides, but the overall movement is through the Strait of Juan de Fuca and out of Puget Sound. In fact, the flow of freshwater is the driving force that controls water movement in estuaries throughout the world. Like a conveyer belt, freshwater from streams moves along the surface out to sea, while heavier seawater from the ocean moves inward along the bottom. The amount of nitrogen contained in Puget Sound’s salty bottom layer is largely dependent on winds and subsurface currents in the Pacific Ocean. The California Undercurrent brings nitrogen-rich water north along the coast from Mexico. At the entrance to Puget Sound, winds can trigger upwelling, in which these nitrogen-rich waters rise from the depths and creep into the Strait of Juan de Fuca. These ocean currents are, in turn, influenced by longer cycles, such as El Niño and the Pacific Decadal Oscillation. Within Puget Sound, the deep flow of incoming ocean water is occasionally disrupted by a ridge, known as a sill, protruding up from the bottom. Prominent sills — including those in Admiralty Inlet, Hood Canal and the Tacoma Narrows — direct some of the heavier water up toward the surface. On sunny days, this nitrogen can contribute to plankton growth in Puget Sound. Circulation patterns and major sills in Puget Sound. Graphic: 2007 Sound Science report figure 3-5. Some of the nitrogen-rich water goes over the sills without coming to the surface. In the absence of sunlight, such nitrogen has limited effects on the growth of plankton. As for nitrogen coming from sewage-treatment plants, the story begins at the end of the effluent pipe on the bottom of Puget Sound, where the depth varies from one plant to the next. Composed of lighter freshwater, the nitrogen-rich effluent rises as it mixes with the surrounding saltwater before coming to equilibrium. Depending on the depth and location, much of this nitrogen joins the deep layer of ocean water and heads south on the conveyer belt, farther into Puget Sound. River flows during the winter have less effect on plankton, which are growing slowly because of limited sunlight. Consequently, much of the nitrogen from winter flows gets washed out to sea or mixed into deeper water by winds and waves. During the spring when sunny weather appears, nitrogen from the rivers becomes readily available to feed the plankton, which are then eaten by other organisms or else die and end up on the bottom. During summer, lower streamflows mean reduced seaward migration of the surface layer and less mixing with deeper water. Plankton growth continues until the available nitrogen at the surface is used up. Puget Sound enters a new phase as the huge biomass of plankton produced earlier begins to break down in deep water, triggering a decline in oxygen. Slow-moving or nearly stagnant waters within small, enclosed bays and inlets are the most vulnerable to low-oxygen conditions in late summer and early fall as bacteria break down the plankton and consume the available oxygen. Eventually, the autumn rains get the conveyor belt moving again, while storms churn up the water and return oxygen to the depths. These basic circulation patterns, which drive the growth of plankton and ultimately cause low-oxygen conditions in many places, can vary greatly from year to year, depending on short-term weather conditions as well as long-term oceanic cycles. Alterations in circulation patterns also are influenced by climate change, with growing deviations expected in the future. For example, climate change has a tendency to melt the winter snowpack earlier in the year. That diminishes the summer streamflows and slows the conveyor belt of estuarine flow. The ultimate results are expected to be more extreme declines in dissolved oxygen. Recent studies have revealed that a significant portion of the sewage effluent discharged into Central Puget Sound follows the deep layer going south. Some of the nitrogen-rich water eventually crosses over the Tacoma Narrows sill and finds its way into the shallow bays and inlets of South Puget Sound, where low-oxygen problems are most acute. By all accounts, reducing human sources of nitrogen going into Puget Sound at specific times will dampen the problems with plankton blooms and oxygen depletion. Some experts argue that it is more important to reduce the nitrogen coming down the rivers, since those waters float on top where plankton grow in the sunlight. Others maintain that the primary goal should be to reduce the nitrogen in sewage effluent, since much of that moves with deep water toward South Puget Sound, where low-oxygen problems are most pronounced. The Salish Sea model is designed to account for currents, plankton growth and other biological and chemical processes. The overall system is extremely complex, but if the model works as devised, it should help people formulate a plan of action, including priorities for nitrogen reduction.